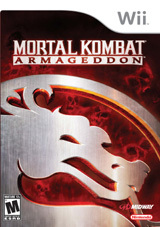 Midway has released the final boxart of the Nintendo Wii version of Mortal Kombat: Armageddon. Slated to be released in March 2007, Mortal Kombat: Armageddon for the Nintendo Wii will bring the final iteration of 3D Mortal Kombat fighters on last generation consoles to Nintendo's unique and hot selling console. Featuring an unknown control scheme that is rumored to use both the wii remote and nunchuck attachment, Mortal Kombat: Armageddon for the Nintendo Wii will be an interesting twist on the 3D fighter genre. Mortal Kombat: Armageddon is the last chapter in the current generation of Mortal Kombat games. Featured initially only on Microsoft Xbox and Sony PlayStation 2, the game has the largest roster of characters and also features a new "kart" racing mini-game dubbed Motor Kombat. Armageddon also features a new konquest adventure mode game and also touts the first ever Kreate a Fatality and Kreate a Character mode which allows you to customize your very own Mortal Kombat fighter and customize many different ways to kill them.